Jim and Cathy Ross welcome you to Shonekla's Home Page. 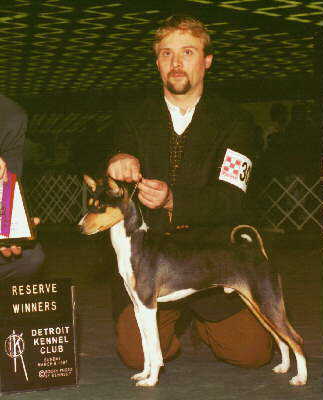 We are currently owned by two Basenjis, Bandit, pictured above and Shoney (Am Ch Klassic's Twice as Nice). Shoney is also only one point away from her Canadian championship and we will be adding her photo very soon. The last one we had up her was a Christmas photo, so a new one is definitely needed. Although we haven't been in Basenjis very long, we are totally hooked on this very independent, intelligent little dog. They are addictive which accounts for the fact that we now have two. Please check back from time to time as we update this page.